It was recently my birthday. As befits any celebration of having successfully completed another solar orbit, there was a lot of eating. A lot. All of it was vegan, and pretty much all of it was delicious. I visited Genesis for the first time with friends as part one of my mega-birthday chowdown. Genesis is an all-vegan place where everything is organic and the interiors are that Insta-friendly shade of pink with copper plant holders. Because I'm more interested in the food than the decor, here's a picture of my Torta Milanesa, a London take on a Mexican sandwich. Here it is in its unspoiled state, before I picked it up and it all fell apart, shedding guac and aubergine and salsa everywhere. Note great big hotdog in the background! Not sure what cheese Genesis uses, but I'm not a fan - it gave the burger a funky overtone (not in a good Prince-type way) and the mac and cheese was way too sweet. Don't let that put you off their otherwise lovely selection of sides - the kimchi fries and cassava chips were high on the tasty-o-meter. I'd definitely go back to Genesis, I'll just be dodging the cheese when I do. 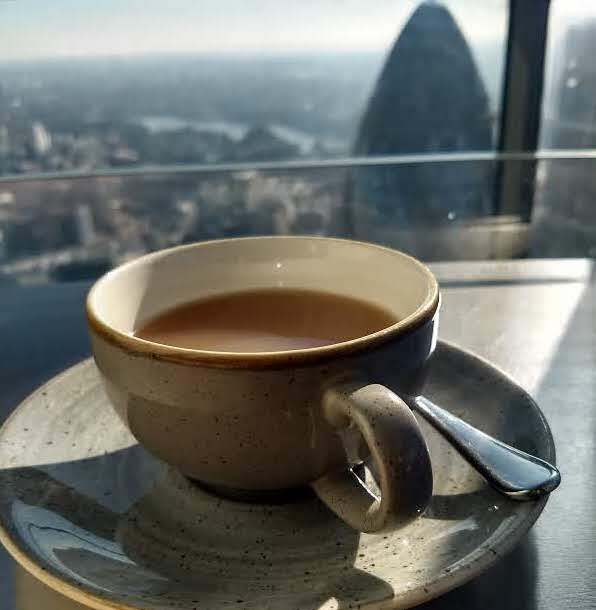 Next up, a trip to Duck and Waffle with Mr Flicking the Vs. We didn't eat anything there, so I can't report on how vegan friendly it is - the menu doesn't have anything marked as vegan, but himself has been there for work and reported they made him a cracking vegan breakfast, so what do I know? Instead, I just had a cup of tea. My birthday was an unseasonably warm day, so we sat and looked out over London and basked in the warmth like happy cats. It wasn't the sort of food we eat every day (or even very many times in our lifetime. Or even once before, really), and it was fun to get all fancy for a change. Even dedicated mushroom-dodger Mr Flicking the Vs enjoyed the fungus heavy menu, which is a rarer accolade than any Michelin star. Whoever wrote that has better handwriting with chocolate has better handwriting than I do with a pen. My last honourable vegan birthday mention goes to Midnight Apothecary, an event that happens every so often down in the tunnels of the Brunel Museum. There are cocktails made from ingredients grown nearby or foraged, film screenings or a band, and outside, there's a campfire outside where you can toast your marshmallows. Being a herbivore, I brought a bag of animal-free marshmallows (thank you very much, Freedom Mallows) and proceeded to toast away happily. Later on, one of the Midnight Apothecary crew popped out and asked if there were any vegans, because they'd got in some vegan marshmallows and put them to one side so the omnivores didn't accidentally chow down on them. Happy days! Things have been quiet here lately, as a big hole in my budget (due to having to finance a four hour commute for a while!) meant there's not been much in the way of exciting cooking or eating. No more of those fancy M&S meals here, no sir. Trying to fill in the black hole in my financies means eating on the cheap, and so I've been cooking as much as possible from the cupboards and freezer. I just used up half a bottle of passata, a tin of black eyed peans and some root veggies to make a stew, then made some dumplings to go with, using flour and vegan suet from the stores. Cheap, filling and tasty - it didn't feel too much like eating punishment meals. But all that frugality means I haven't got lots of exciting meals to share with you, so here are a few random pics from my phone from over the last few weeks. 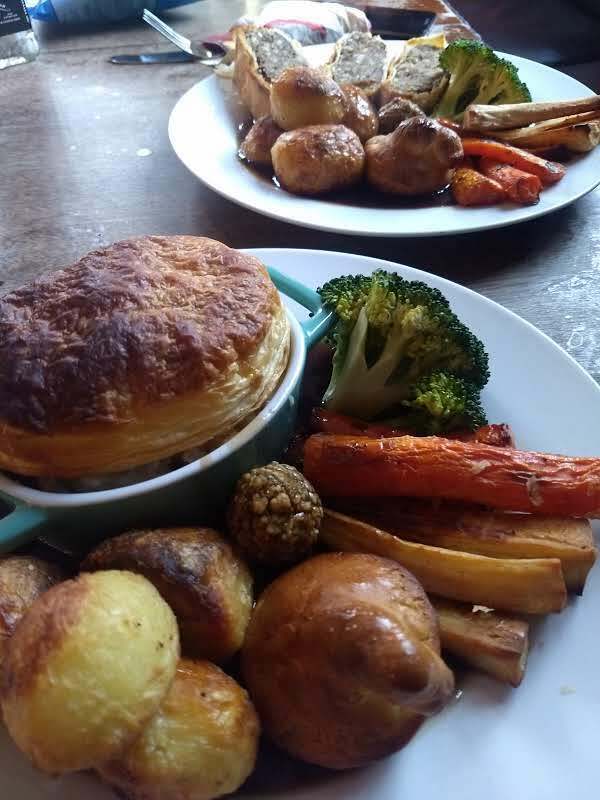 A few weeks back, I went down to official home of the best vegan Sunday roast in South London, the Amersham Arms. Only it turned out I'd picked the one day that they weren't serving Sunday dinner. After drying my tears, I took the barman's recommendation to try the Royal Albert a short stumble down the road. 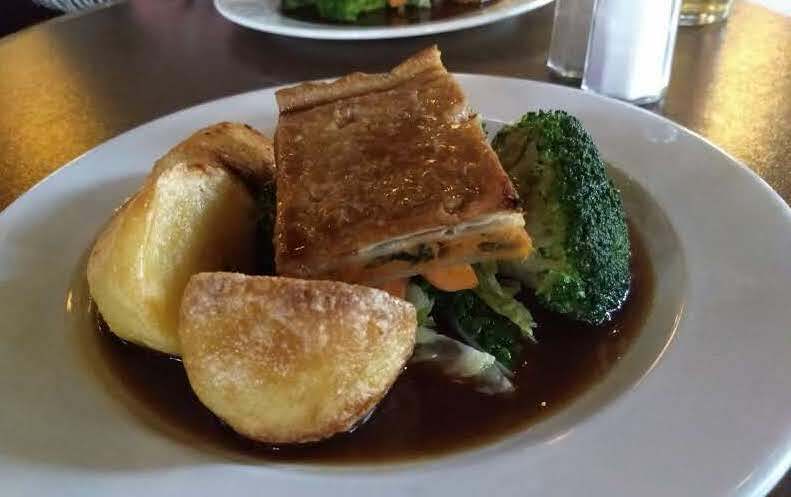 Getting a good vegan roast in a non-specialist pub has always felt like getting soy milk from a stone, but the Royal Albert actually delivered. The vegan roast was a sweet potato, kale and mushroom pie, along with all the good roast trimmings you'd like to see: roasties, carrots, broccoli, cabbage and a swimming pool of gravy. As a side note, I appreciate that the Royal Albert prices their vegan roast a few quid cheaper than the meat versions. It gets my (vegan) goat when places try and charge the same for vegan and meat meals: come on, folks, we know how much meat costs and we know how much vegetables cost. Stop trying to rip off vegans. Hat tip to the Royal Albert for not trying the same trick, and for a good roast. Having been denied our lovely Amersham Arms roast, we headed back to New Cross a couple of Sundays later to get the roast of dreams. I deviated from my usual order of Wellington, in favour of the chick'n and leek pie. It was nice, but I know now I was wrong to cheat on my beloved Wellington. Never again. That roast - look at those yorkies! - was definitely worth the wait. And talking of long awaited vegan feeds, I'm happy to report I finally found a branch of Greggs that had the celebrated vegan sausage roll in stock. I bought one, took this pic and then snaffled it quietly on the train home. 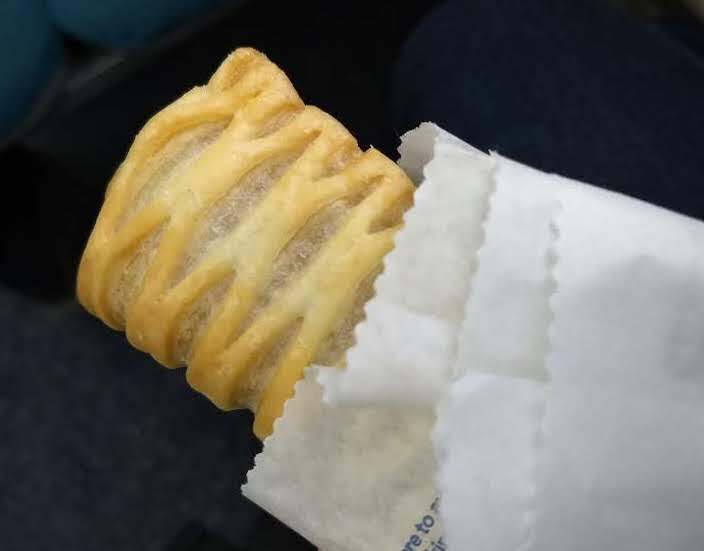 After weeks of hearing people tweeting about how good the vegan sausage roll was, did it live up to expectations? In short, naaaah. I didn't love it. It just tasted way too salty, and the texture was a bit pappy. I'm not a convert to the Gregg's vegan sausage roll, but I'm glad it exists. I'm glad high street chains are adding more vegan options, I'm glad that there's something you can grab at a train station without animal ingredients, and I'm glad that it only costs £1.20. When you're on a tight budget, £1.20 for the latest vegan sensation seems very pleasing indeed. Thanks to a combination of Veganuary and, well, veganism generally taking over the world at the moment, every other week seems to bring with it the launch of a new vegan product line. Sound great - like the Greggs vegan sausage roll that's been sooooo popular I haven't been able to find one in any of the Greggs I've been in. Some sound like people with a history of vegan-bashing trying not to get left behind the trend that they used to slate (yeah, Gordon Ramsay and the people behind Pure Filth, I'm looking at you.) Some companies, meanwhile, seem to have really put some proper effort into making vegan ranges that make herbivores like us feel spoiled. I'm tipping my hat to you on this one, Marks and Spencer. From everything I've seen on that there internet, the reviews if Marks and Spencer's Plant Kitchen range have been almost universally impressed across the board. As a fully not-paid-up member of the impoverished student club, Marks and Spencer is not normally where I go to fill up my trolley, but having seen so many folk saying nice things about it, I thought I should go and check it out for myself. The first thing I liked about this was the size - it's a good portion for a hungry vegan. The second thing I liked is that someone's tried to make it a little more interesting that your standard mac: there's some fried mushrooms and some paprika crumb on top to make things a bit more fancy. But what about the mac itself? The last time I tried a readymade mac, it was a Daiya version and I didn't love it all. It tasted like someone had had a sweaty socks party and added some pasta. Not nice, not nice at all. The Daiya and Plant Kitchen's macs were like night and day: the Marks and Spencer one was creamy, comforting, a gentle cheese taste with some mustard in the back. It walked a happy path between gentle flavour and painfully cheesy, tiptoeing gracefully around both and ending up neither. TL;DR: I'd definitely buy it again. The next time I went past an M and S, there was a yellow-stickered vegan lasagne, so I snapped that up too (I love a yellow sticker, who doesn't?!) 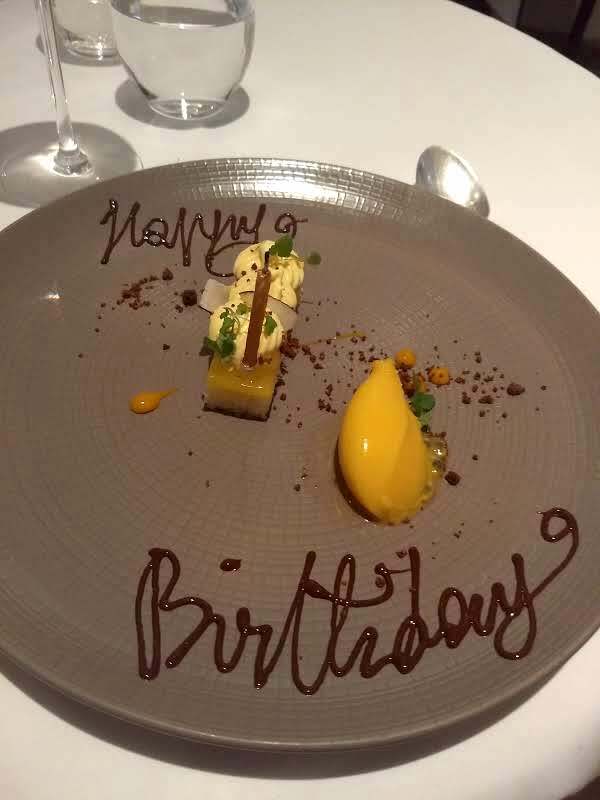 I was expecting a vegetable-based lasagne, but instead got one with soya mince. And that's no bad thing - the last supermarket vegan lasagne I tried was a bit wet from the water leeching out of the veggies, this one held up better. A vegan lasagne shouldn't be that exciting, but the Plant Kitchen was actually really good. Sorry I didn't take a picture - I ate it too quick. 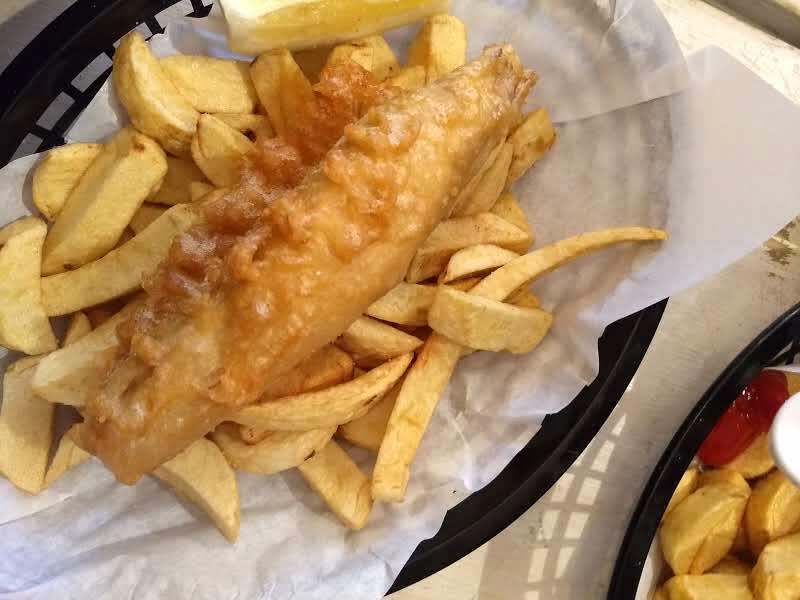 It's the sort of food that comforts you against winter, that doesn't trouble your teeth on the way down, and leaves you feeling better about life when you're on the outside of it. Give me with one of these, a couple of slices of bread and (vegan ) butter, and I'll be a happy vegan. TL;DR, I would definitely buy that again. Are dirty fries a thing? I mean, are they are a recognised dish? I'd never heard of them before. They're chips, with tomato sauce, behamel sauce, and cheese on top. I guess they're basically lasagne but with cut up spuds instead of pasta. I love the idea of getting creative with your chips. 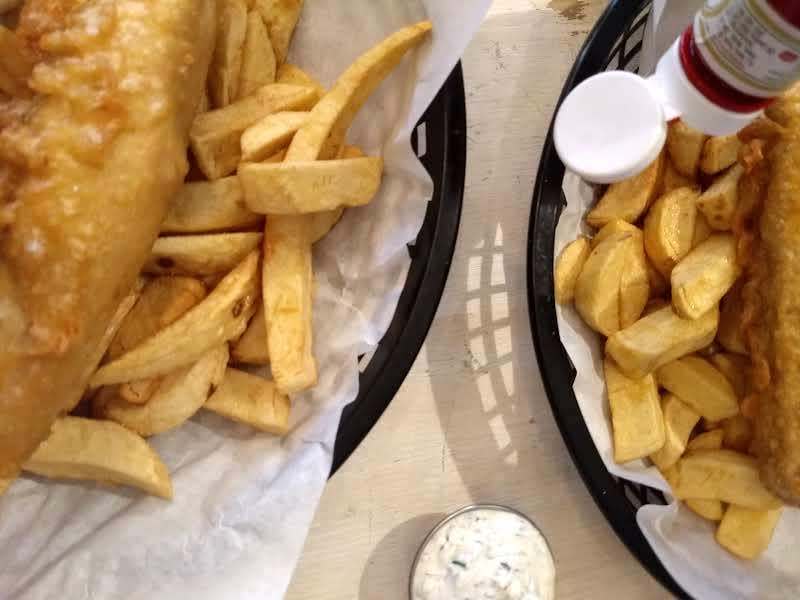 I've been a convert to chips with sauce since someone persuaded me of the righteous merits of putting gravy on your chips, and if chip shop curry sauce were vegan, I'd be ordering that every day. I'm not entirely convinced about lasagne chips though. 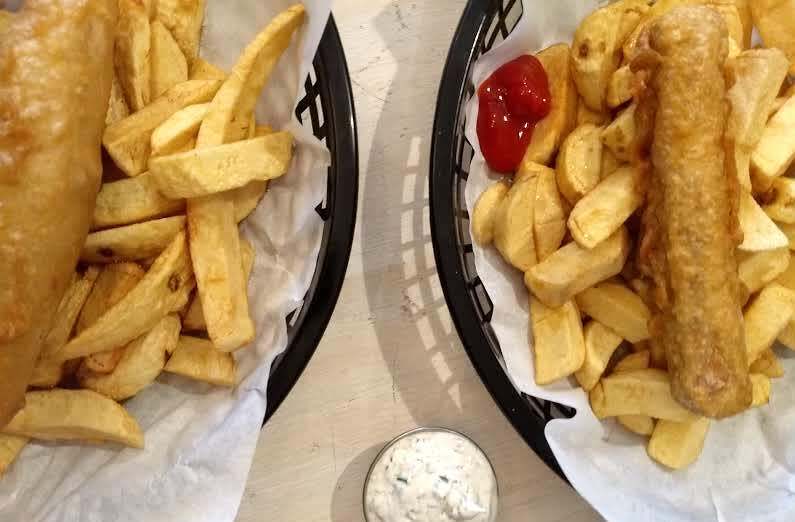 Chips should be crispy, and these ones, having slept in a bed of tomato sauce, had gone a bit soft. It wasn't something I'd tear someone's hand off to try again, but I like that M&S has gone beyond just offering standard really meals like Thai green curry or bean chill (though they do those too). Still, I'm totally a convert to Plant Kitchen. It's vegan food that doesn't feel like an afterthought, a will-this-do attempt at plant-based eating. If you see a hungry looking vegan looking for more yellow stickered vegan goodies in your nearest M&S, don't forget to say hi to me - I've got a feeling I'll be spending more time at Marks. Plant Kitchen: Is Marks and Spencer's new vegan range really all that? Like pretty much everyone else I know, I've been watching Tidying Up with Marie Kondo on Netflix. And like most of those people, I then fell in love with Kondo, and the way she inspires you to take a decluttering magic wand to all your crap. I started on the kitchen a little while ago in the interests of saving money by using up the food I had at home, rather than heading straight out to the supermarket and stocking up. After watching Tidying Up, I thought I should finish the job and take on those ingredients that have been haunting the corners of the store cupboards for years. My favourite victim of the kitchen clear out was a package of flour meant for making Chinese dumpling and buns. I bought it because I loooooove Chinese dumplings and buns, but the instructions seemed to go on forever (make up the flour with other ingredients, knead, leave, steam, I forget the rest) and I just never got around to it. Who has time for kneading dough and waiting for it to rise? Phhht. Not this vegan. The flour went out of date in 2015. I like to view use by dates as a challenge, and I was determined to finally thank the flour for its service and put it to good use. I followed the packet instructions like it was the secret recipe for turning lead into gold. I didn't quite end up with a shedload of bullion, but I did end up wowed by how one neglected package dumpling flour could turn into amazing fluffy buns. I used them up first with some leftover stew, then with a big bowl of hot and sour soup, with loads of tofu and veggies. Luckily, they were still old enough to make some incredible bakes. I tweaked the recipe for coffee and walnut cake here, and the icing recipe here, and make some mocha cupcakes. I made about eight, the perfect size for eating with lunch during my placement. And with homemade cakes on hand, I resisted the urge to buy Rhythm 108 bars instead - that's nearly a tenner saved! Cheers, Marie! And having made those glorious bakes, I decided it was time to use or lose a hand mixer I bought in 2015 to make aquafaba meringues, and used only a handful of times since then. It wasn't doing much joy sparking, I'll admit. But having seen how flour and bit of ingenuity can yield beautiful results. I thought it was time to get the hand mixer doing what it was born to do. Instead of venturing back into aquafaba territory, I pressed the dough hooks into service to make more bread. I tried making focaccia, and then a cracking crusty loaf. I don't think I've ever made any breads that were quite so good. I've been saying thank you to the hand mixer - and Marie Kondo - ever since. It may feel like winter to you, my lovely readers - or even summer if you're in the Antipodes - but to me, it's still autumn. No, my little corner of London hasn't got its own microclimate, I've just been raiding my stocks of autumn fruit that have managed to last the season. A friend of mine has a quince tree in her garden which has been freakily prolific, laden down with golden, scented fruits. The last few times I've seen her, she's given me a bag of them. I was run ragged by the last term, and I felt just a bit too tired to spend much time in the kitchen. The holidays and new year gave me a fresh cooking mojo though, and I felt compelled to turn the quince into something worthy. Now for the disclaimer: I took a picture of the bottom of the jar not only so you could see that peach-pink colour, but also because I only managed to make enough for a couple of inches of jelly! Yep, I turned about five quince into... about as many tablespoons of jelly. If any of you guys are expert jelly makers, please tell me what I did wrong! How did so much quince disappear? I've heard in whisky making, a chunk of the liquor disappears along the way - that chunk is called the angel's share, as it was thought that that angels helped themselves along the way. If that's what happened here, I hope they're enjoying it - there may not be much, but it's still tasty. I had a bit more success with the quince gin I made. I am totally convinced that there's no fruit that can't make a gorgeous gin out of (apart from may be avocado or tomato, but I wouldn't entirely bet on that!) Making flavoured gin is the easiest thing you can do - chop up some fruit, leave it in the gin for a few weeks and then strain and add sugar. It didn't have quite the heady quince-ness of the jelly, but it was still good, and the cloves and cinnamon gave it a gloriously festive flavour. It's not all been quince, quince, quince here though (which wouldn't have been a bad thing, I think) - I also managed to dig out the bags of damsons from the bottom of the freezer and make them into something. 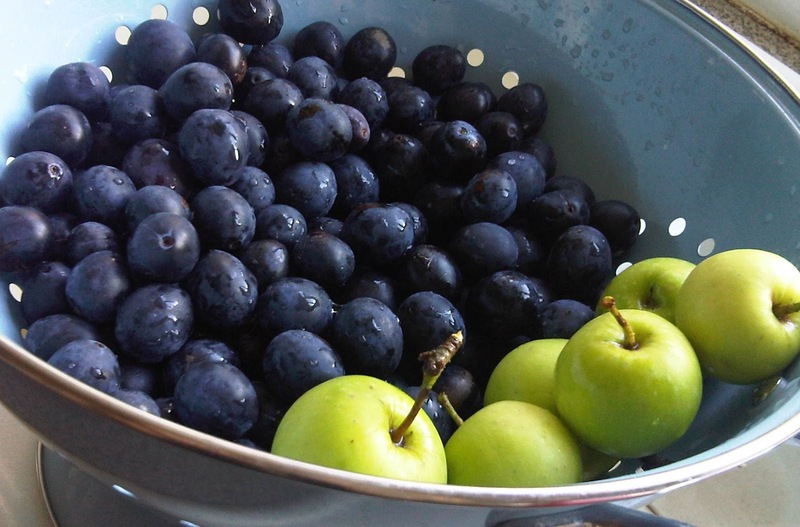 (They looked a bit sad when they defrosted, so please enjoy this photo of my damson haul from a while back). The simplest thing I could think of was to make this recipe for easy plum/damson jam, which I've made before and is just insanely delicious considering how it's just fruit and sugar. I managed to squeak a couple of jars out of the freezer-damsons, and I'll be using it on top of my porridge - a little bit of jammy autumnal goodness to drive out the winter months. Hey friends, how's your January going? I'm still making the most of all the food in my store cupboards and freezer, trying to declutter my kitchen and enhance my budget. If I was overhearing someone telling their friends about doing the same, I'd be thinking 'well, that's sounds boring and painful' and feeling well-meaning pity for the cupboard-raider I'd been eavesdropping on. Turns out it's neither - I've made lots of lovely vegan food, and I've not had to dip into my overdraft yet, so no complaints from the Flicking the Vs corner of London. Here's my first lot of repurposing: turning leftover Christmas pudding into truffles. If you're reading this with your mouth open, thinking 'leftover Christmas pudding? What in the name of all that's good and holy...?' then I'm sorry to have disappointed you, dear Christmas pudding loving reader. I like Christmas pudding too, but I'd gorged on it over December, and just didn't need to finish off the piece in the cupboard. Other adventures into food money saving is freezer diving. You know, when you root around in all those anonymous tubs in your freezer, pull one out, and use it to make tea - that's freezer diving. I found this curry in an old takeaway tub in the bottom drawer of the freezer, and it was actually pretty tasty. I found a couple of tubs of chilli, and one sausage casserole, so I got decent lunches all week without doing any cooking. There's one tub left (place your bets in the comments below as to what it contains!) and once it's done, I'll be stashing some more goodies for the future version of me to enjoy later one. Elsewhere, my fridge is totally paying out. I still haven't quite used up all the stuff I bought for Christmas (I can't be the only one, can I? Tell me you have the same problem, dear reader). Notable Christmas overstayers are a box of Oatly creme fraiche and single cream, and a jar of posh pickled onions. Not sure what dish I could make with those three ingredients, but I'll let you know when I find out and I've recovered from the resulting nausea. When Ma Flicking the Vs came over for Christmas, she brought a massive homemade chocolate cake and we've been making our way through it slowly ever since. This week, we bade farewell to the final slice. After a couple of weeks away from university, I've had a bit of time to get into the kitchen and start cooking properly. I thought I'd try and make hamburgers and buns for them from scratch, using the ingredients in my cupboards. Here they are, waiting to go into the oven. Both burgers and buns ended up containing vital wheat gluten - the burgers for binding, and the buns because the recipe said it would give the bread a good texture. It certainly did that, but it also made it taste faintly of seitan, which I'm a bit averse to. 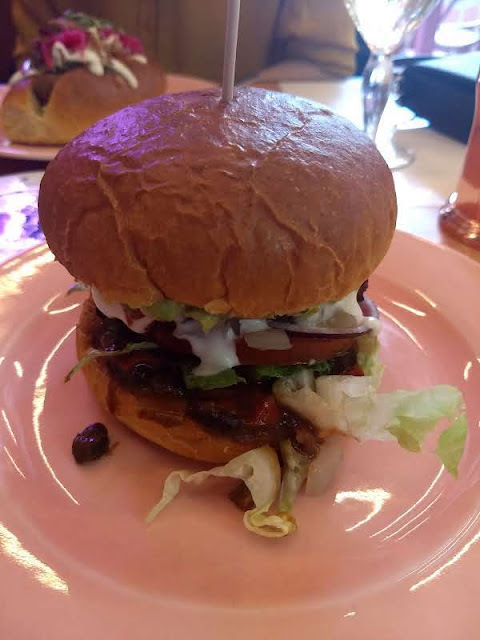 A seitan taste when there's a burger in your bun? Fine. When you're using the rolls to make toast and jam? Erk, not so much. Still, making the rolls wasn't actually as hard as I thought it would be, so I'd do it again, just not with the vital wheat gluten. And though I don't think I'm going to be giving The Vurger Co any competition any time soon, I still saved myself the price of a takeaway or some supermarket junk food. Maybe making the most of your freezer and your cupboards isn't so bad after all!